I'm sorry it's been very quiet around here lately. My husband has been overseas for a few months and will be home in a few short days. Hooray! It's amazing how much work (and recuperating!) it takes for one person to run a household, do homeschooling with two kids, teach at church, run errands, fit in some girl time, etc. Whew! It doesn't leave much time for blogging. However, we've survived the long separation and I'll be glad for things to settle back down and have my sweet husband home. 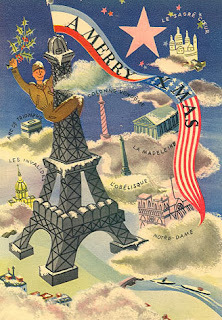 With the coming holiday, I thought it would be fun to post a few WWII Christmas cards I found here and there online.